After the interesting findings about the relatively good dynamic range properties of the Pentax K-x (cf. Lumolabs: Pentax K-x sensor quality), many have requested to publish a comparison with some other well known camera models. Well, I am happy to announce that a great photographer and dear friend of mine, Karsten Pawlik (kafenio.org) shares my passion and we could spend some time in studio together in order to compile this comparison. Most of the photos (e.g., all Nikon photos) presented in this article are © Karsten Pawlik. 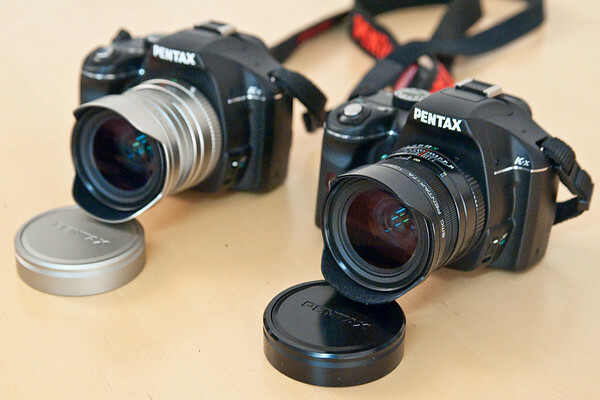 The opening photo shows two Pentax K-x with the gorgeous Pentax FA 31/1.8 Limited lens, in both black and silver color. Nikon D700 is a full frame camera and captures 1.2 stops more light than both the Nikon D5000 and Pentax K-x which are both APS-C only. It is interesting to see if this advantage shows in images. The above chart summarizes the noise levels for 18% gray patches (2800 °K tungsten) at various values for ISO: 100, 1600 and 12800, measured as a signal to noise ratio (SNR [dB]). Please read Lumolabs: Welcome and testing methodology for details about how we measure these values. Towards the end of this article, you'll find links to all original test shots suitable for further examination. Within this article, I will ignore the fact that the D5000 delivered the best SNR at ISO 100. AT ISO1600, we see the expected result: About 3dB or 1 f-stop (1EV) advantage for the full frame D700 with respect to both D5000 and K-x. At ISO 12800, the K-x manages to match the result of the D700 while the D5000 behaves as expected. However, the SNR should decrease by at least 9dB when going from ISO 1600 to 12800 while it only decreases by only about 6dB for the K-x. This is a sign for raw file noise reduction at work for the Pentax and I believe that all SNR values for Pentax K-x should be reduced by 3dB for ISO values of 3200 or higher. In summary, we confirm the 1 stop advantage for the full frame sensor as far as high iso gray level noise is concerned. The situation turns out to be more complicated when we study the respective dynamic ranges. 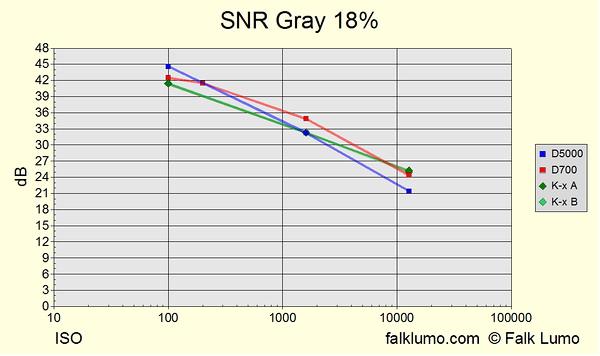 Let's start with the full SNR curves for all cameras. Look first at the three red (D700 full frame), blue (D5000) and green (K-x) curves in the middle of the graph: These are the ISO 1600 curves for the three camera models and the red line lying above the others shows the full frame advantage we have been talking about above. The curves show how the signal-to-noise ratio decreases (relative noise increases) towards the shadows (the lower luminosities towards the left). At ISO 1600, the full frame advantage remains significant throughout all luminosities spanning 7 stops (1%). Note that the curves at ISO12800 may be "polluted" by noise reduction tricks for the APS-C sensors. Most important for the determination of dynamic range are the SNR curves at lowest ISO (i.e., ISO 100). In order to measure deepest shadow noise, we made three shots at ISO100: normal, underexposed by -5EV and underexposed by -10EV! Patches from all three shots were analyzed to compile an SNR curve spanning 13 stops (down to 0.02% luminosity (which is RGB 0.05/255 and sRGB 0.6/255 aka perfect black)). The surprising result is that at deepest shadows, the D5000 outperform the D700 by 2 dB and the K-x by even 5 dB. This should translate to about 0.5 EV more dynamic range for the D5000, and about 1.5 EV more dynamic range for the K-x, when compared to the D700. DxO does indeed confirm more dynamic range for the D5000 (12.5EV) compared to D700 (12.2EV). In combination, this is a confirmation for the "13EV or better" dynamic range claim I made in my earlier blog article. I decided that this isn't the full story. Numeric results of measurements of noise are one thing. Plausibility checks are another. The above chart contains various (small) noise patches from all cameras and ISO values. I even added some Pentax K-7 patches for comparison (Note: the K-7 has more pixels). Towards the end of this article, you'll find links to all original test shots suitable for further examination. A quick examination of the patches at ISO 100 and -10EV shows that the D700 wins hands-down: better color accuracy, better readability of letters and better contrast. It sure looks slightly more busy (more noise) but the noise looks more fine grain too. More fine grain? Yes, the noise from the D5000 and K-x look coarser than the noise from the D700 or K-7. But noise should be statistically uncorrelated and look always fine grain (except for pattern noise). Good detail note: all three cameras have no visible pattern noise. Obviously, the sensor of the Nikon D5000 and Pentax K-x (and I guess it is the sensor rather than the firmware) plays some tricks with the signal in deepest shadows: there seems to be some sort of deep shadow noise reduction at work (like binning dark pixels) which leads to softer detail and a lower noise measurement. Therefore, I conclude that the excellent dynamic range measurements of the D5000 and K-x are partly due to sophisticated signal processing, possibly on the sensor itself. However, even taking this disclaimer into account, we can say that the deepest shadow reproduction of all three cameras play in one league: e.g., look at the 153 letters in the -10EV samples and compare to the K-7 (-9EV only) where the letters aren't legible anymore. and are all very close. The ISO12800 patches roughly confirm the numeric lab results. A K-x at ISO12800 and a K-7 at ISO6400 do roughly have the same noise while the K-7 keeps a slight resolution advantage even at such high ISO values. Traditionaly, there is a one stop difference between full frame and APS-C. Temporarily, this sensor (Nikon D5000, Pentax K-x, supposed to be a Sony Exmor sensor) fills the gap (towards a Nikon D700) with respect to dynamic range while the difference remains with respect to high ISO noise. This means that the D5000/K-x sensor has the same sensitivity to light as usual (as the D700) but has significantly reduced read-out noise. The Pentax K-x may have a slight advantage over the Nikon D5000, esp. at very high ISO values. At the same time, this sensor (or firmware library) seems to include raw data alteration which makes the numerical analysis even more difficult, even when done in the DxO way. The time for true signal measurements has come, defining random noise as the sample variations of the signal and fixed pattern noise as the difference of the mean value with the ideal signal. 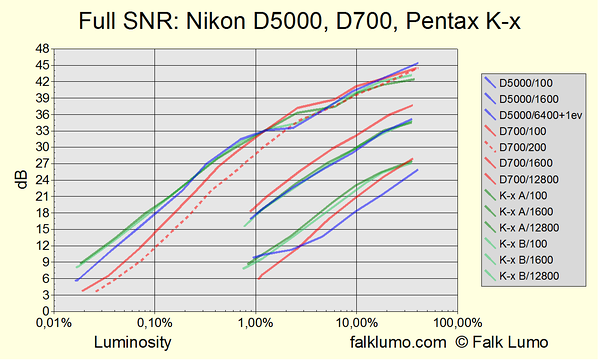 Lab tests (our own and the ones published by DxO) make the D5000/K-x have better dynamic range than the D700. But this is due to the limited testing methodology. D700 still has the better dynamic range, but by a small margin only.